As we drive around the roads of Ireland we see so many Round Hay Bales and sometimes they look so lonely and sad, just lying there in the fields and sometimes even wrapped up in plastic. Well now is your chance to give a new lease of life to what we like to call, “The scarecrows first cousin”. Get a bale, dress them up, give them a happy smiley face or come up with an even better cool idea that will set it apart and who knows, might even win you the top prize. A new addition to the festival in 2016, it is now in it 3rd year and has proved very popular and a great challenge for everyone. Why not give it a go!!! 1. You will have to book your Round Hay Bale and Pitch by ringing (086) 8320139 or (087) 2319393 and let them know what your theme and idea is. 2. Download the entry form, fill it out and get it to us. 3. Go to your Pitch on Saturday 28th July and start decorating your Round Hay Bale, to have it ready and completed on Sunday 29th July by 12 Noon – the opening day of the festival. Bale decorating will start on Saturday 28th July, ready for the opening of festival, with bales completed on Sunday 29th July by 12 Noon. Round Bales will be supplied to all entrants, by the Durrow Development Forum. A limited number of bales will be available so be sure to book early – €10 per entry. Open to clubs, families and groups of friends. Round Bales will be provided by the Dorrow Development Forum. Each team will be responsible for decorating their own bale with their own materials. (One round bale only per entry). Entries will be on a first-come first-served basis. (Book early as there are a limited number of bales). Each team will be required to provide their own caption for their entry. (Theme must be given to competition organisers on entry to avoid duplicate entry ideas). Bale decorating must be started on Saturday 28th July and completed on Sunday 29th July 2018 by 12 Noon (no amendments can be made afterwards). 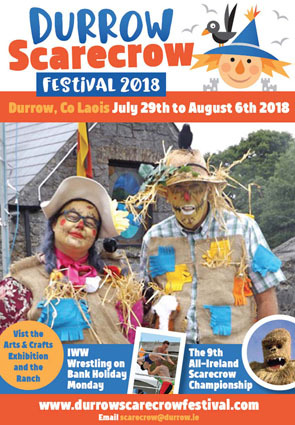 Entries must be ready for Scarecrow Festival opening on Sunday 29th July 2018. Entries will be judged on creativity and use of materials. Entries should be weather proofed as much as possible. Paint may be applied to the hay bale but bales may not be cut or shredded. The area around your bale should be clean and tidy on completion. (All areas to be cleared by Wednesday 8th August following the festival). Entries will be judged by Sunday 29th July 2017. €300.00 in prize money. (Divided at Judges Discretion).